Win the NEW Rumparooz OBV OS Pocket Diaper! 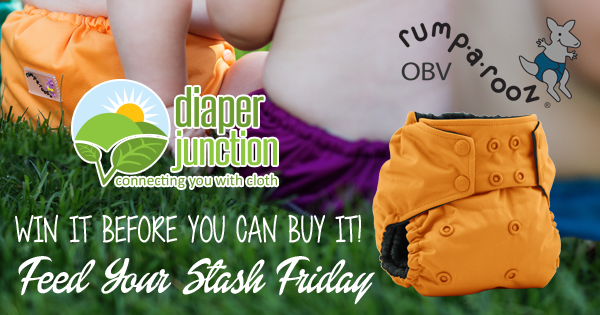 9/30/16 FYSF, Win a Rumparooz OBV One Size Diaper! Win it BEFORE you can BUY it! The Rumparooz OBV One Size Diaper! We're excited to announce the addition of the NEW Rumparooz Organic Bamboo Velour Rumparooz OS Pocket Diaper to the Diaper Junction lineup. So excited, that this week we're even giving you a chance to win one before you can buy one! This One Size Diaper boast an ease of use equivalent to a disposable diaper! Four diaper sizes packed into one diaper makes it ideal for those families interested in a single pocket diaper to diaper their babies from birth (6.5 lbs.) to potty training (35+ lbs.). Double Inner Gussets! The patented design of their double internal gussets, also known as the "poop scoop"! The scooped-out contoured shape of the inner, double-gusset area channels each leg, creating a sort of "pocket" to hold messes in place and protect from baby blow-outs! You won't find this feature in any other cloth diaper on the market! One lucky Diaper Junction fan will win their choice of color in the NEW Rumparooz OBV One Size Diaper! This giveaway is open to the USA & Canada. Winner must be 18 years or older to enter to win. Winner will be notified by email and will have 7 days to reply and claim their prize. This is amazing, that your doing this giveaway! Who ever wins this diaper is getting a luxurious diaper!! This would be perfect my soon to be newborn!